Did you get your fill of plum pudding, or sugar plum fairies, over the Christmas holidays last month? 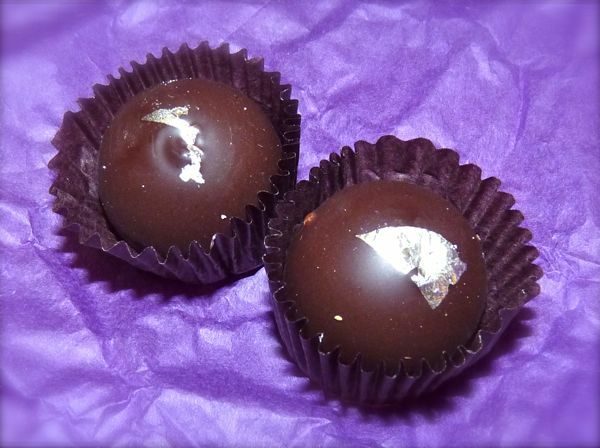 If you missed out...Today's Plum Pudding truffles from Vosges (Chicago) would be a great choice. These kicked off Day #1 of Chocolate and Almond Marzipan Theme Week. These truffles were constructed with layers of flavor - including plum, Armignac and marzipan, and were coated in 65% dark chocolate, and decorated with a shred of silver. My apologies for the photo (at right). 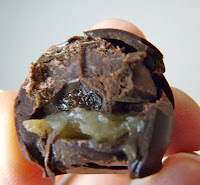 When I bit into these truffles, they didn't hold together, so this pic will give you only a rough idea about the tasty flavor combination within.